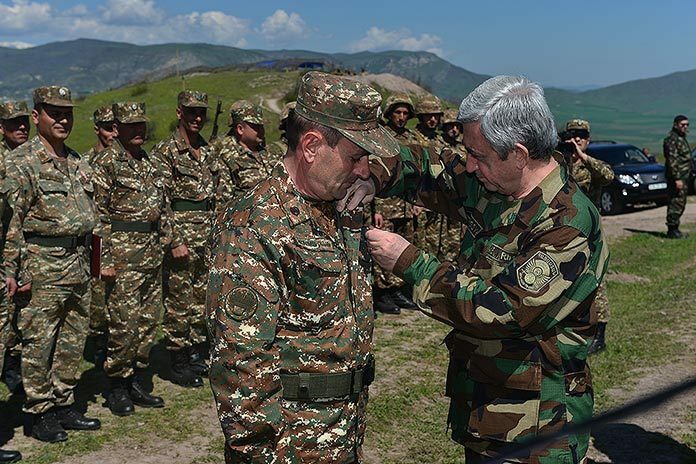 Armenian President Serzh Sargsyan has commended Nagorno-Karabakh’s ethnic Armenian army as he awarded medals to several dozen of its soldiers who demonstrated courage and valor in fighting against Azeri troops during the April 2-5 clashes. “You have once again showed who the Armenian soldier is… When it is necessary to fight, you become the most disciplined, the most ingenious, and the most combat ready troops,” Sargsyan said at an award ceremony held at a military base in Nagorno-Karabakh on Tuesday. Sargsyan stressed that in the face of Azerbaijan’s aggression “not a single Armenian soldier or officer left his position”. “They fought selflessly to the very end,” he said. Ninety-two Armenian soldiers and volunteers were killed during four days of fighting in Nagorno-Karabakh. More than a hundred were wounded. A number of Armenian civilians were also killed in Azerbaijan’s missile strikes or by its commandos who raided at least one village in Nagorno-Karabakh. President Sargsyan also spoke about the savage behavior of Azeris during the four-day hostilities as he addressed the Karabakh soldiers.